The Sunday newspapers may not have got through, but Monday morning's did, and many carried news of the broadcast on their front pages. Only then did some listeners discover that the BBC account of London's weekend riots had been a hoax dreamed up by a mischievous Catholic priest. 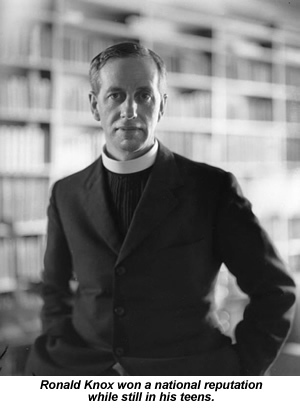 Ronald Knox was born in 1888, the son of a clergyman who went on to become Anglican Bishop of Manchester. His maternal grandfather was a Bishop too, and his eldest brother went on to edit the satirical magazine Punch. Knox quickly established himself as a brilliant scholar, publishing his first collection of verse at the age of 18 and establishing what the Dictionary of National Biography calls “a nationwide reputation” by the time he left Eton for Oxford's Balliol College in 1907. He was elected president of the Oxford Union two years later, after winning many prizes for his Greek and Latin verse there. He left the university with a first in Greats and an even higher reputation for brilliance than he'd had before. In 1912, he became an Anglican priest and, later that year, the Chaplain of Oxford's Trinity College. Knox would sometimes exercise his formidable brain by setting himself additional little challenges in the writing he produced. Two of his earliest publications were theological works criticising modernist trends in the Church of England, which Knox spiced up - if only for his own benefit - by writing one in the style of Dryden and the other of Swift. Anything less, it seems, would have left him bored by the childishly simple task of detailed theological argument. He had a wicked sense of humour too, and often brought this to bear in his writing. Growing irritated with conspiracy theories that insisted Shakespeare could not possibly have written his own plays, Knox concocted a few cryptograms from Tennyson's In Memoriam and used these to prove conclusively that the poem had been written by Queen Victoria. This mischief showed again in his 1911 lecture Studies in the Literature of Sherlock Holmes, where Knox set out to parody the German School's influential Biblical analysis by applying its methods to a piece of popular entertainment. The German School picked apart the text of the Bible to fret over questions like why both Matthew and Mark's gospels choose to relate John the Baptist's death as a flash-back and ask what this implied about their authorship. Knox mocked this approach by using minor inconsistencies in the Holmes canon to conclude that Dr Watson had clearly fallen prey to drink after Holmes' death at the Reichenbach Falls. No longer able to chronicle his friend's real-life adventures, Knox argues, Watson took to making up inferior new tales by stealing plots from authors like Guy Boothby (Dr Nikola), Edgar Allan Poe (The Gold Bug) and EW Hornung (Raffles). By drawing such a fanciful conclusion from highly selective evidence - and resolutely ignoring Arthur Conan Doyle's role in the stories' declining quality - Knox hoped to make the German School's method look equally silly. Instead, many Holmes fans simply took the lecture at face value, making it a foundation stone for their own obsessive study of the stories. Even Doyle seemed to miss the joke, writing to Knox a few months after the lecture was published to take up its criticisms over four excruciating pages. Knox taught at Shrewsbury school for a while during World War I, and then began working for the War Office. In 1919, he left the Church of England to become a Roman Catholic priest. The BBC launched its first radio broadcasts in November 1922, and Knox began his own radio career with a few short sermons the following year. British radio in those days was regulated by the Post Office, which depended on the newspaper industry for much of its income. This gave newspaper owners the leverage to ensure the BBC's news service was severely curtailed. No news summaries were allowed before 7:00pm, to prevent broadcast news competing with the evening papers, and the BBC was banned from giving any sporting results for the same reason. As late as 1926, its live broadcast of the Derby went out only on the strict understanding that it must not reveal who won. Despite these restrictions, and despite the fact that only a single station was available, radio quickly became a popular medium. In 1923, the BBC started producing Radio Times, a magazine listing its exact schedules for every day of the coming week, producing an extra surge of interest in the service. The following year's broadcast of cello player Beatrice Harrison dueting with a nightingale in her garden began an annual series which produced over 50,000 fan letters for her. That's interesting, but hardly conclusive. There's no record of Welles visiting Europe before his father's death in 1930, and nothing in that brief quote which ties his own production directly to Knox. For that, we must turn to the June 29, 1967 edition of the Radio Times, where a BBC correspondent in America called Leonard Miall writes about War of the Worlds producer John Houseman. “Houseman, as a boy had been in school in England,” Miall writes. “And had remembered a production he had heard on April 16, 1926, just before the General Strike. This was Father Ronald Knox's famous broadcast about a fictitious riot of the unemployed in London. I'd love to claim Miall's letter as definitive proof that Welles' hoax was directly inspired by Knox, but I think that would be a step too far. As we've seen, though, Broadcasting the Barricades did make headlines in America, and it's perfectly possible that Welles or Houseman saw these reports and filed the information away for future reference. All we can say for sure is that Broadcasting the Barricades went out on the air nearly 13 years before War of the Worlds, and that it's therefore Knox, not Welles, who deserves to be recognised as the world's first great radio hoaxer.